Luxury suites at the University Of Phoenix Stadium include 20 seats, a private restroom, lounge area, 3 flat screen TV's, and a dedicated suite attendant. Guests will get VIP parking and In-suite catering is included. Package also includes ground transfers to/from all airports and events, and 24/7 on-site dedicated operations manager and concierge. These 10 tickets are in a shared suite located on the loft level. It will include catering and VIP parking. The tickets will be in the first row of the suite. This loft suite will be a shared suite. All 16 tickets will be grouped together. In-suite catering and VIP parking is included. 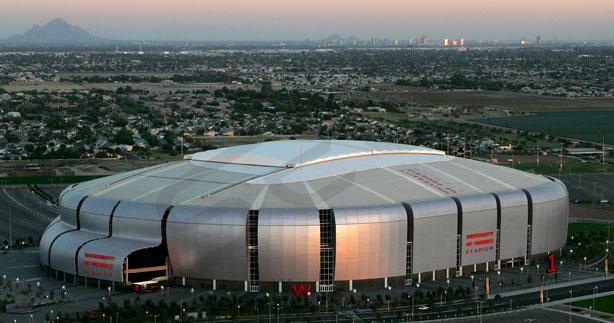 Thank you for signing up for specials at University of Phoenix Stadium. Enter your email address below to stay in touch. We'll sign you up for our newsletter, which will inform you of the latest inventory and events at University of Phoenix Stadium. We promise we will never sell or distribute your information. The seating chart below shows where the suites at University of Phoenix Stadium are located.